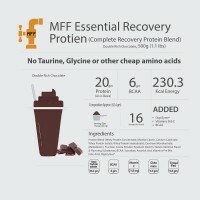 MFF™ Essential recovery protein shake is researched and designed specially to provide you better post workout recovery. Our body goes through a stressful period during the time of workout and a proper recovery of the body means the recovery of different kinds from glycogen level recovery, muscle repair, immunity maintenance, inactivating oxidants produced post workout, protecting tissues, and many more. MFF™ Essential Recovery Protein shake is a complete post workout recovery protein which is designed to provide complete recovery helping you to not just recover better but become stronger. Protein is basic food for our muscles. It very important nutrition which helps us to repair, maintain and grow our muscle tissues. Our muscle tissue break while performing daily activities or during the workout and it’s important to feed them right to repair them properly to maintain or grow them as per individual goals. The ratio of protein has been selected to provide quick absorption of protein for instant repair of broken muscle tissues to slow absorption of protein which helps in sustained muscle recovery for up to 8 hours. MFF™ Essential Recovery Protein powder contains added recovery carbohydrates which are essential for the glycogen recovery of the body. One of the reasons we feel tired post workout is due to the loss of glycogen level in our body which works as an energy source. This product helps to recover lost energy after intense workout making you feel active more quickly rather than lazy after the workout. This product contains an added blend of different vitamins and minerals. Vitamins and minerals play a very important role in recovery and development of our body. When we work out the requirement of vitamins and minerals in our body increases as workout not just put pressures on our muscles but can affect our immunity, energy generation capability from carbohydrate and fats, damage cells, oxygen transfer rate to tissues in our body and many more such cases. 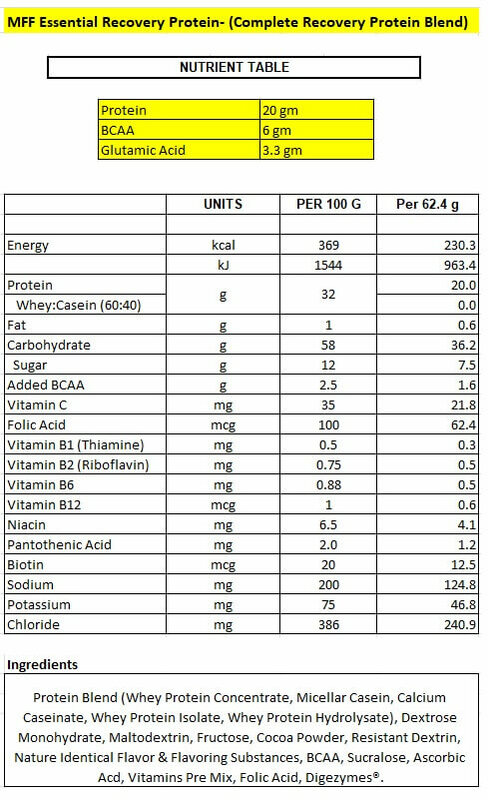 Added Vitamins and Minerals have gone through many stages of research to help complete the required vitamins and minerals nutrition, recovery from our post workout damages/ increased needs and help us become stronger to achieve better sports and fitness goals. Vitamin C- Added Vitamin C plays a very important role in maintaining our immunity as it helps in producing antibodies which are needed to protect our body post exercise when it is most susceptible to infections. It helps in absorption of iron which is required for the formation of hemoglobin which carries oxygen to our muscles. It also works as an antioxidant which is required to protect and inactivate the oxidants produced post workout. Antioxidant also protects our tissues from injury or damages. BCAA also known as Branched Chain Amino Acids is a combination of Leucine, Iso-leucine, and Valine. BCAA helps to increase the protein synthesis in our body which increases overall muscle growth. It helps to maintain the lean muscle mass and neuromuscular adaptation improvements which also improve the strength development. BCAA also helps in protecting muscle tissues from muscle loss during long or intense workout sessions. Glutamine as a source of naturally occurring amino acids plays a very important role in our body. Glutamine in Recovery Protein Shake powder can helps to reduce overall recovery time and increases the over protein synthesis of the body. During the workout, glutamine not only helps to reduce muscle breakdown but also helps in quick repair of broken tissue which is broken during an intense workout. MFF™ Essential Recovery Protein contains added DigeZymes® which is a combination of Amylase, lactase, cellulase, protease, and Lipase. This combination of enzymes helps in faster digestions and absorption of protein and carbohydrate for the faster recovery. What makes MyFitFuel Provide Best Recovery Protein Powder Shake in India? a). 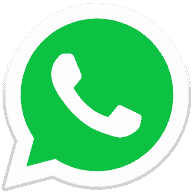 Quality:- That is always our biggest priority. We at MyFitFuel never compromise in quality of any of our products and we innovate to help you achieve better sports and fitness goals. b). Consistency:- Consistency in the quality of MFF™ Essential Recovery Protein shake powder is very important for us. Front beginning before procurement of ingredients to supplying finished product, we take different measures to provide you the same nutrition quality everytime. Consistency always help you get the same high quality nutrition which we promise. Pour 250 ml of water in a good blender/shaker like MFF™ Blender and add 2 Heaping scoops of MFF™ Essential Recovery Protein. Shake it for 15-25 seconds and consume immediately. Benefits of taking with Water- Taking MFF™ Essential Recovery Protein with water helps you to get faster recovery and also helps to get Lean Muscles Mass. Benefits of taking with toned or double toned milk- Adding milk with MFF™ Essential Recovery Protein helps to make the shake creamier and thicker. But adding 250 ml of toned milk will also add almost 150 extra calories and more protein from milk in every shake. So, if you are looking to recover and bulk up to increase weight then taking MFF Recovery Protein shake with milk will always be recommended. Adding milk might make the recovery protein very thick which will take longer to mix. Ingredients: Protein Blend (Whey Protein Concentrate, Micellar Casein, Calcium Caseinate, Whey Protein Isolate, Whey Protein Hydrolysate), Dextrose Monohydrate, Maltodextrin, Fructose, Cocoa Powder, Resistant Dextrin, Nature Identical Flavor & Flavoring Substances, BCAA, Sucralose, Ascorbic Acd, Vitamins Pre Mix, Folic Acid, Digezymes®. I tried first time recovery protein. It is effective as i have used it.